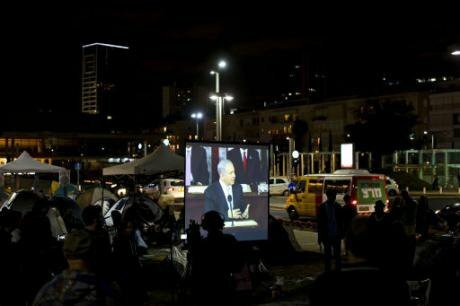 Israelis watch Prime Minister Benjamin Netanyahu address the US Congress in downtown Tel Aviv, Israel, March, 2015. Oded Balilty/Press Association. All rights reserved. There is much in Jonathan Rosenhead’s reply to my article (The Contestation between anti-Zionism and anti-Semitism; openDemocracy, 27 July 2016) with which I agree, albeit he accuses me of wrestling with a straw person. Given that Rosenhead appears, wilfully or not, to misunderstand the main purport of my argument, I am inclined to throw the ‘straw person’ metaphor back at him. I do not argue that, to quote him, ‘criticism of Zionism as a whole should be off limits’. Far from it; I do not regard myself as a Zionist and am highly critical of Zionism; I thought I had made that clear. However, what I posed was the issue of the right of the state of Israel to exist; an issue which is ducked by those who fail to distinguish between civil society and the state. The logic of the failure to make such a distinction would be, for example, to blame the British and US populations for the war in Iraq rather than the governments of those two countries. My point in looking at the various iterations of Zionism historically was to explain that it is not a monolithic entity and that this helps to explain why it is that many inside and outside Israel who call themselves Zionists are opposed to the expansionist policies of the current and previous Israeli governments. Regardless of one’s views on the ‘correct’ definition of Zionism or the origins and subsequent history of the Israeli state, the question of Israel’s continued existence cannot be wished away by sloganizing nor by presuming that its Jewish inhabitants will dematerialise or meet a worse Hamas-style fate. The important matter is to agree and fight for a different kind of Israeli state; one which is non-expansionist and which guarantees the rights of Palestinians both within Israel and outside it in a state of their own. Rosenhead quotes (at length) Gideon Levy’s Ha’aretz article in which he bemoans the absence of a radical left in Israel as though this is revealed truth rather than merely a matter of opinion. Some would say the same about the state of the left in the UK, the USA and many EU countries – they are wrong, although that doesn’t mean that those of us who are active in our unions or on the left can pretend that all is well. There are two other issues which prompt a response from me. The first relates to the issue of anti-semitism in the UK. Rosenhead says that although there is an increase in ‘rhetoric about antisemitism’ that this is ‘quite divorced from any actually discernible increase in antisemitism itself’. The Community Security Trust (CST) would challenge his assertion. According to this organisation, they recorded 557 anti-semitic incidents across the UK in the first six months of 2016, an 11 per cent increase on the first six months of 2015. This is the second-highest total CST has ever recorded for the January–June period of any year. CST, a Jewish organisation, has been recording anti-semitic incidents since 1984. Does Rosenhead doubt the veracity of these figures? I can’t, however, quarrel with Rosenhead’s mention of the elephant in the room; notably the issue of supposed anti-semitism in the Labour Party. He makes an incorrect and rather snide assertion that I wrote my original piece to support the Jewish establishment’s anti-Corbyn position. Nothing can be further from the truth. To put the record straight I am now including the paragraphs on this subject which were lost to my original article due to editorial cuts. The Conservative Party has historically been the place of refuge for anti-semites, racists and Nazi sympathisers. Despite its support for the present Israeli government, the Tory Party has never sought to root out and discipline anti-semites and racists within its own ranks. Secondly, criticism of the Israeli government cannot be regarded as anti-semitic. The Likud coalition government should be roundly criticised for its expansionist and intensely anti-Palestinian policies. Many Jews (myself included) and many Israelis are profoundly opposed to these policies. Thirdly, it has to be acknowledged that criticism of government policies, no matter how obnoxious they are, should not be construed as an attack on the population of the country ruled by the named government, including, of course, the government of Israel. A distinction must in all cases be made between the state and civil society. Failure to do so runs the risk of collectively punishing the people for the crimes of their government. Whilst this might appear to be an obvious point, it is not a trivial one. My starting point was to elucidate an understanding of the meaning of Zionism; a term and a political concept which is rarely defined and frequently misunderstood. This is hardly surprising given that today in the twenty first century, Zionism/ist is construed as an insult by some and is often equated with apartheid and even worse, Nazism. My understanding of Zionism seeks neither to exonerate, praise nor condemn. Rather we must seek to comprehend the Zionist movement and concomitant ideology in its historical, material and constantly evolving context. I'm quite sure that none of this will satisfy Jonathan Rosenhead, especially since he presumes to know my opinion of Corbyn and wilfully misunderstands my position on BDS. As an activist in NATFHE and the UCU all my working life and an executive committee member of both, I argued against the academic boycott. I was in a minority. Of course, I’m very well aware of the PACBI position, but I don’t agree with it. Rosenhead’s assertion that the boycott doesn’t target individual academics may be true but it is specious and a trifle Jesuitical given that conferences, courses and research are all part of the daily work of individual academics. However, this does not mean I support the Israeli government. I want to ally with all those who want to work for a genuine and viable two state solution and to my certain knowledge this includes numerous Israeli academics, regardless of their institutions’ managements, most of which, as in this country, support the status quo. It is quite clear that the Likud government has no intention of moving in the direction of a two state solution. Netanyahu said (11/9/16) that support for the removal of Israeli settlements in the West Bank, as part of a two-state peace deal with the Palestinian Authority, was the equivalent of advocating for the “ethnic cleansing” of Jews. Remarkably the US government criticized this statement thus prompting Trump to side with Netanyahu. I earnestly hope that a Labour Party led by Corbyn will lead to greater support for Palestinian rights and a genuine two state solution. But at the same time it is essential that the strictures on the conduct of the debate around issues of anti-zionism and anti-semitism elucidated by Chakrabarti are adhered to.